A wide range of Hammers are available, varying in shape, size and weight. The different styles reflect different uses. Around the house, the average diy'er only really needs one or two type. The shape of Hammer heads has not changed much over the years although some modern materials are now used in both the head and handle. Traditionally handle were made of wood fixed through a hole in the head; this allowed the handle to be easily replaced if required. Modern hammers use modern materials and the handles are often built into the head - often with a form of built-in shock absorber to make them easier to use. Claw Hammer The most popular hammer for general work, available with a wooden (often hickory), glass-fibre or steel handle; with or without rubber grip. The most popular weights are 455-680g (16 to 24oz). The claw is normally curved, and incorporates a 'V' cut-out to draw nails from timber. The claw can be used to lever up floorboards or where other places where a lever is required; care must be taken (especially with cheaper models) as the force applied can easily weaken the joint between the handle and the head. Normally used by engineer's, the pein in this case, is rounded and is usually used for shaping metal and closing rivets. Ball pein hammers are available from 55 - 1100 (4 oz up to 2 lb. ), 110 - 165g (8oz 12oz) are the most suitable for general use. Handles are normally wood, usually Ash or Hickory. Again, mainly used for shaping metal, the pein can be at right angles to the handle or parallel with it. The most useful domestically is the cross pein, where the pein can be used for starting panel pins and tacks. Handles are normally wood, usually Ash. A lighter version of the Cross and Straight Pein hammer, ideal for light joinery and cabinet work. Weight 55g (4oz). Sometimes called a Lump Hammer, it has a double faced head, and is useful for light demolition work, driving steel chisels and masonry nails. As debris is likely to fly, the wearing of safety glasses and working gloves is recommended. Weight 1135g (2 1/2 lb) being best suited to domestic work. Handles are normally wood, usually Hickory, or synthetic resin. Used for the heavier jobs, such as driving in stakes or to break up concrete, stone or masonry. For lighter jobs just the weight of the head may be used for blow's, but for heavier work, the hammer is swung like an axe. Wear suitable protective clothing, including safety glasses. Weights 7, 10 and 14 lb. Used to drive chisels or to tap wood joints together, where a metal-faced hammer would cause damage or bruising. Note that the head is slightly tapered to ensure correct contact with the work. Both the handle and head are wood, usually Beech or Lignum Vitae. Various types are available, with hard and soft rubber, plastic or copper faces. Some come with a choice of faces which are interchangeable. Useful for striking materials such as chrome wing outs, where a steel face would cause damage. In some cases, can replace a mallet for cabinet work. From here on, there are specialist hammers developed to meet the needs of various trades. These include a Brick Hammer for striking a bolster or splitting bricks; Woodcarving Mallet, with rounded body; Veneer Hammer, for pressing and tapping veneers into place; Upholsterer's hammer for driving tacks and nails in confined spaces, and Sprig Hammer, used by picture frame makers. 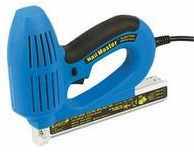 More often referred to as 'powered nailers', these take the hard work out of fitting nails, staples etc. They are ideal where a large number of nails need to be fitted, such as fixing floorboards. They range from light duty (for use when fixing edge mouldings, picture frames etc) to heavy duty nailers, used to fix floorboards and garden decking etc. Always use the right hammer for the job, it will make the job easier and avoid possible damage to the hammer/workpiece. Never hit nails with the side of a check or a hammer head. The metal at these points is not hardened as the striking face and could be damaged. When assembling delicate work, use a piece of scrap wood between the work piece and the head of the hammer. This will prevent damage to the workpiece. Use a nail punch to sink nails into the timber, again this will prevent damage to the work piece. A nail punch has a flat end (or slightly, concave) to fit the nail head rather than the pointed end which other punches have. Where the handle is held in the hammer head by steel wedges, check regularly to ensure the wedges are tight. Timber handle can shrink in dry conditions. If a timber handle does start become loose, place the head in water overnight, the water will cause the handle to expand and tighten in the head. If a hammer tends to slip off nails, roughen the face of the head using a medium abrasive paper. Always wear safety glasses when driving masonry nails or breaking up concrete.